Anyway. What have the Shames have been up to? I just published my latest short story for The Accidental Magic Project: “Tea for Deux,” based very much on two of my dearest and oldest friends. This was a great example of a story that I’ve been thinking about writing for years; I remember my initial excitement when I first thought of it, and a flurry of note-creating as I explored the idea, and then it went dormant for a couple of years while I collected the necessary material. That’s pretty much how I write my best stories these days – pulling from ideas that struck me some time before and have been simmering on the back burner. I haven’t been as steadfast about my 7:30 PM writing habit as I’d like, but part of that is having a vacation week this week and being out of town. Still, I’m tracking my word sprint counts using Chris Fox’s 5,000 Words Per Hour method (in an Excel document), and it’s cool to see that number grow so quickly. 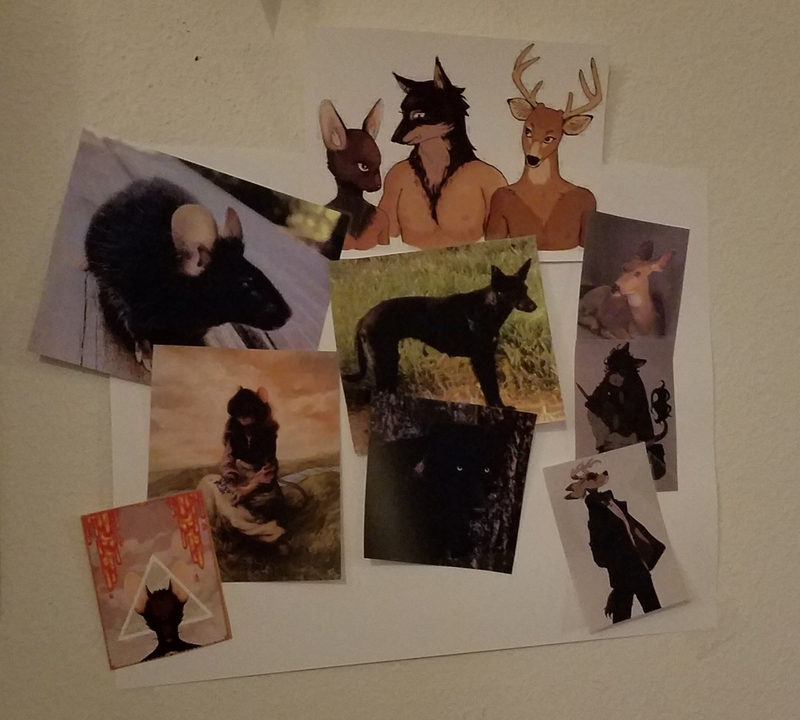 I printed out a bunch of my inspiration pictures – art and photos I’ve gathered (mostly on the curated blogs I follow on Tumblr these days) that remind me of various aspects of Portent – and put them in loosely-related collections on the wall around my workspace. Like this! Inspiration pics for my main trio. No real movement for the Shames on the Star Citizen front – I’m going to get a sprint-focused start on my articles for the fall issue of Ships Illustrated, but otherwise, we’ve more or less let this avenue go dormant for a little while. Four of Jake’s guitars are currently listed on Reverb; if you have any interest in a pretty cool custom axe, check his stuff the heck out!